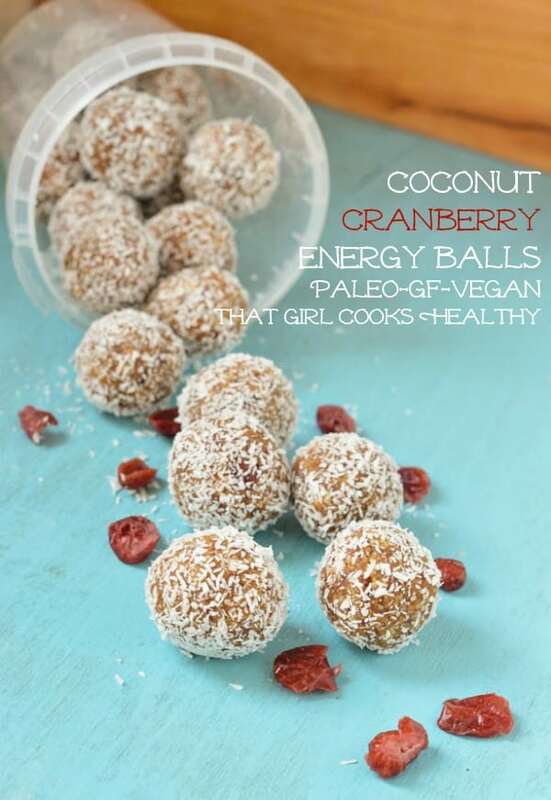 I’m up to my old tricks again; here is a coconut cranberry energy ball recipe that I made. 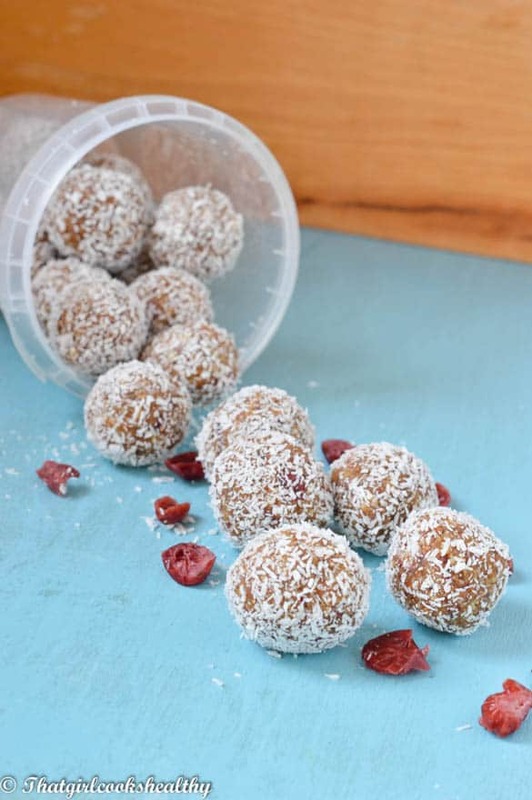 As I’ve already mentioned previously energy balls make the perfect snack. They are filling, full of adequate nutrients as well as being irresistibly tasty. Opt for some of these instead of a sugar laden chocolate bar – the health benefits alone should convince you. I’ve never really been a huge fan of refined sugar, there’s just something about it that gives me that awful crash and burn. In fact this is exactly the reason why I avoid it like the plague. Sugar is the subliminal cause to a plethora of health issues, many people are under the impression that salt and fat are the main protagonists which attribute to disease but sugar is on the same level playing field. For this recipe I used organic cranberries – the dried, unadulterated ones. I suggest you do the same. Most cranberries that are commercially sold have a tendency to be loaded with additives or some unnecessary preservative(s). I bet you’re wondering what is the sweetness of these little beauties? Are they an excessively, nauseating type of sweetness? HA! Well to answer your question it’s quite subtle and complementary. The combination of cinnamon which is excellent for reducing hypertension and cranberries – enriched with antioxidants (responsible for fight radicals that can lead to health adversaries), fiber and vitamin c (cell rejuvenation) create the perfect way to eat your way to better health. Grind the walnuts and almond using an s-blade in a food processor on high speed until a fine consistency is formed. Add the coconut and cinnamon – pulse for a few seconds to combine with the ground nuts. Slowly add a few pre soaked dates at a time until all are transferred to the processor and then add the cranberries. continue to blend until the mixture pulls together as one big ball. 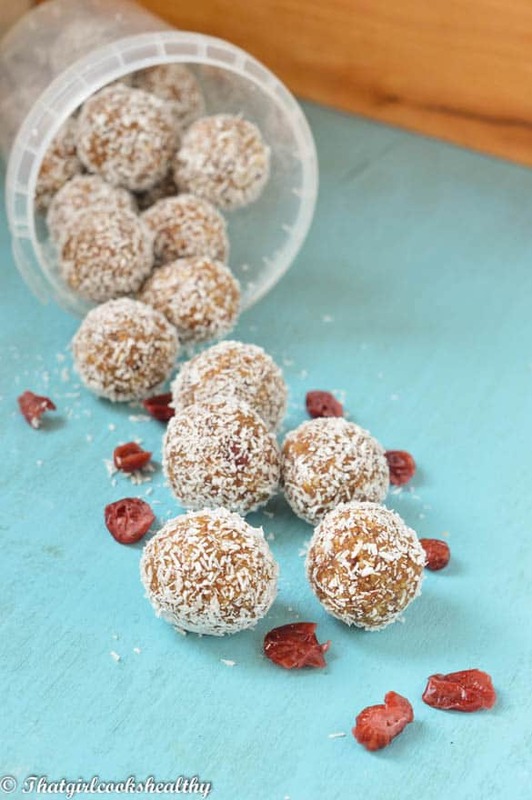 Use hands to roll into mini balls and dust with the excess coconut. This batch makes roughly 15 energy balls. 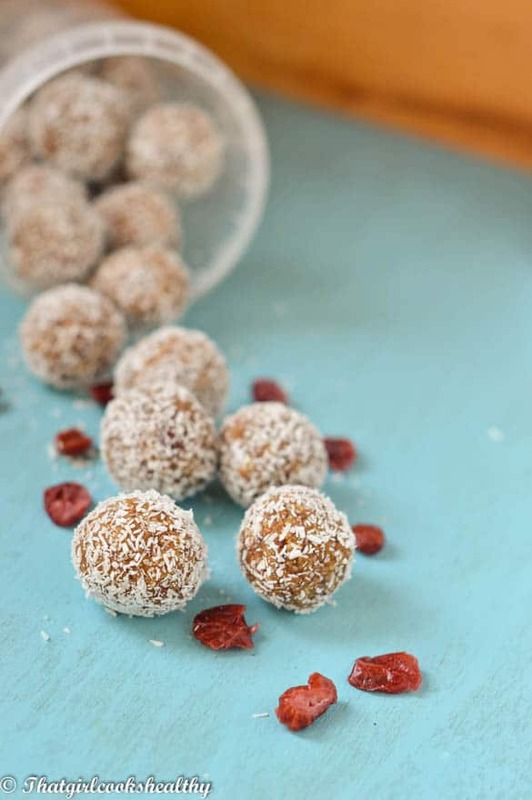 You can be really inventive with energy balls, so let me know how that works out for you. I’m also a fan of raw cacao, almost to the point where most of my desserts contain some cacao lol. 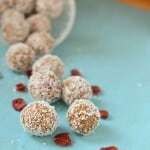 I have a coconut chocolate energy ball recipe which is featured in the recipe index. You might like that one. I buy something very similar at my local health food store but they are about 1.75″ in diam. What diameter are yours ? I would say they are about the same size.